To all our four-footed friends! And their pet parents! Proudly Serving our Colorado neighbors – Johnstown, Milliken, Loveland, Greeley, Evans, Windsor, Berthoud, Platteville & Surrounding Areas. We refer dog and puppy training to Amy Creaven, KPA-CTP. Check Amy's website at www.creavengoodbehavior.com or email her at trustyourdogtraining@gmail.com. Share – Google Review Us! Tell everyone how much you love us! Write a Google Review - Click this link to go to the Google Business Review page. Thanks! For your kind words on our behalf. We would love to hear about how our care helped you and your pet. Please consider leaving a review on our facebook or google+ pages. We love helping your best pet friends. Thank you! First visit, the staff are truly wonderful. Dr. Tribbey took good care of Mags. – Been back three times since our first visit. Still a fan of the staff and how well they take care of Mags! First visit for my newly adopted pup and I. Treated with respect and with knowledgeable care. Everybody that works here, is the best!!!! They treat you like family and you know they care about your fur babies! I have 5 (cats) and I know when I take my kids here. They get the best care!! Love everyone there!! Best vets, ever!!!!!! Every single staff member I have met is wonderful. Their love of animals is evident and I love the overall atmosphere of the clinic. Compassionate care for pets, and also their parents when things must come “Full Circle”. First vet visit for Scooby today! The staff is very friendly and took good care of my pup. I was so blessed to be able to work with Dr. Mahoney, Dr. Tribbey and the Full Circle Veterinary staff. Their knowledge and compassion never ceases to amaze me. As a past client and employee I will miss being able to bring my animals to someone that I trust and know that they truly care about my furry friends. I just might have to make the 2 hour drive to get my animals the best care they’ve ever had. I especially appreciate the holistic approach that they take with animals. I feel very fortunate to have my beloved pets taken care of by Dr Mahoney, Dr Tribbey and the rest of the staff at Full Circle. They have such great compassion and are so dedicated to providing the best care. Both doctors are more than just our “vet” they are truly respected professionals and people I consider as friends. From the bottom of my heart – thank you for all the love and care given to Bentley in his final days. And thank you for the ongoing care of Mercedes and her new companion Lincoln. Feline Friday’s – Save 10%! Save 10% on Cat services for your feline. Not a pet treat, but a human treat! We are carrying an exciting new product – Black Dog Coffee Traders coffee. The one pictured is our signature Full Circle Veterinary Blend. Other blends have pictures of various dog breeds. Black Dog Coffee Traders donates 5% of all profits to the American Kennel Club Canine Health Foundation for Cancer Research. Help support that great cause and treat yourself to some great coffee. $10 per bag right here at Full Circle. Standard Process Changes Lives! At Standard Process, we’ve never been afraid to do things a little differently. Since our company’s inception in 1929, our innovative spirit and passion for changing lives have made us an industry leader. We understand the challenges faced by many patients, consumers, and health care professionals. We believe that nutrition and healthy lifestyles are the cornerstones of good health. Ask your veterinarian about the supplements that promote your pet’s best health! 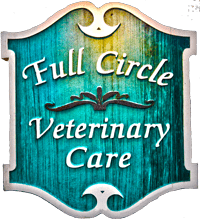 Click Here for more information on the pet supplements that Full Circle Veterinary Care recommends.